WebLogic Express disables the JMS features via the license, so while JMS classes are on the class path, there are no JMS features available. An ActiveMQ broker may be run within WebLogic to provide JMS features while avoiding these issues. As well, an ActiveMQ client may be run within WebLogic to connect to either an ActiveMQ broker running in the same WebLogic instance, and ActiveMQ broker running in a remote WebLogic instance, or a standalone ActiveMQ broker running elsewhere on the network. An ActiveMQ client can be run in any recent version of WebLogic. However, the specifics depend on which revision of JMS is supported by your version of WebLogic. This is known to include WebLogic 8.1 and all previous versions. Note: ActiveMQ cannot deliver messages to message-driven beans in this version of WebLogic. You will need to create JMS clients manually to send and receive JMS messages. To work with ActiveMQ from one of these releases of WebLogic, you should not include any javax.jms classes with your application, but should instead use the JMS 1.0.x classes distributed with WebLogic. This means you should not use a fully-aggregated ActiveMQ JAR such as activemq-4.0.1/incubator-activemq-4.0.1.jar but instead, individual ActiveMQ JARs such as activemq-4.0.1/lib/activeio-core-3.0-beta3.jar and activemq-4.0.1/lib/activemq-core-4.0.1.jar. Further, your code should use only JMS 1.0.x versions of the JMS interfaces (such as javax.jms.Session). Note that JMS 1.1 uses many of the same interfaces, but has added numerous methods to them, and if you use the new methods your code will not run in this version of WebLogic. Try to ensure you’re compiling your client code against the weblogic.jar from the correct version of WebLogic, or else a dedicated JMS 1.0.x JAR such as the one you can download from Sun. Do not compile against a JAR like activemq-4.0.1/incubator-activemq-4.0.1.jar because that JAR includes JMS 1.1! Finally, you can connect to ActiveMQ using the normal ActiveMQ JNDI settings including a connect URL. Do not attempt to use WebLogic JNDI to connect to ActiveMQ, and do not use the WebLogic host name or listen port in the ActiveMQ connect URL – even if the ActiveMQ broker is run within WebLogic it will listen on a separate network port from the one that WebLogic uses. To work with ActiveMQ in one of these release of WebLogic Server, you can use the J2EE Connector included with ActiveMQ (known as ActiveMQ-RA). This will provide full ActiveMQ support to J2EE applications – ActiveMQ can be used to both send messages and to deliver incoming messages to message-driven beans. Your J2EE applications can map connection factory and destination references in JNDI. I don’t have an example of using the J2EE Connector from a J2EE 1.4 application in WebLogic. If someone can contribute one that would be great! If you’re using Spring or another non-J2EE architecture in your application, you may choose to skip the J2EE Connector and just connect directly to ActiveMQ using the technique described in the next section. J2EE Connectors are not supported in WebLogic Express, so that approach is out. Instead, any components that want to connect to ActiveMQ need to manually create the connection (or use a technique like Spring message-driven POJOs to manage it). However, this should be relatively trouble-free since ActiveMQ and WebLogic support the same JMS release. ActiveMQ can hook into the WebLogic JMX management system (as well as e.g. JRockit) to provide a single management interface to the app server, applications, ActiveMQ, and even the JVM. If you decide to run ActiveMQ standalone, that’s fine, you can skip this section. Otherwise, read on. The specific integration techniques depend on whether you’re using WebLogic Server or WebLogic Express, and whether your version supports JMS 1.0.x or JMS 1.1. Deploying an ActiveMQ broker in a release of WebLogic Server or WebLogic Express that supports only JMS 1.0.x has not been tested. This is known to include WebLogic 8.1 and all previous versions. It will probably have trouble due to conflicting versions of JMS used by ActiveMQ and by WebLogic. Using the ActiveMQ-RA J2EE Connector – ActiveMQ provides a J2EE Connector that is normally used by clients to connect to a separate ActiveMQ broker. However, the J2EE Connector accepts arguments to run an embedded broker and provide the location of an XML config file for an embedded broker. This is probably the best way to deploy an ActiveMQ broker in WebLogic Server, because ActiveMQ then has access to WebLogic thread pools and other resources. Deploying an ActiveMQ Broker as a WebLogic Application – This is the technique described below for WebLogic Express. It works equally well in WebLogic Server. Since WebLogic Express does not support J2EE Connectors, it is necessary to deploy ActiveMQ wrapped in an application that is deployed to WebLogic. Note that ActiveMQ runs in the XBean container, so XBean must be pointed to an appropriate configuration file to start up and it will then configure and start all the ActiveMQ components. The first challenge is then to construct an application that locates the right config file(s) and starts the ActiveMQ broker when it is deployed. The easiest type of WebLogic application to configure with all the needed ActiveMQ libraries and configuration and not much else is a web application. The JARs go in WEB-INF/lib/ and config files typically in WEB-INF/. The only necessary configuration for the web application itself is to install a listener that will start and stop ActiveMQ when the web application is started and stopped. There are also a couple optional classes that can be used to integrate ActiveMQ with WebLogic’s security system. Additionally, in this example, a simple web page included in the WAR will be available whenever ActiveMQ is running, so a simple HTTP request can determine whether the ActiveMQ module has been started. The sample below includes an optional configuration block that lets ActiveMQ hook into the WebLogic runtime MBeanServer. This means ActiveMQ MBeans will appear alongside WebLogic MBeans (and even JVM MBeans if they are enabled). With this approach, management clients will access ActiveMQ MBeans through the normal WebLogic listen port (e.g. 7001) rather than using a dedicated JMX port, though IIOP must be enabled for this to work. However, note that this is optional, and you can skip that configuration block and use one of the other approaches (JVM or embedded MBeanServer) to expose the ActiveMQ MBeans. ActiveMQ has optional authentication and authorization plugins, which are based on JAAS. Fortunately, WebLogic provides a JAAS LoginModule that performs the authentication against the default WebLogic security realm, and returns the appropriate principals for authorization. Unfortunately, by default, ActiveMQ cannot authorize access to specific users within the security realm based on WebLogic principals, meaning either there’s no security or a login is required but any user with a valid login has full access to ActiveMQ. However, with custom security classes like the ones shown below, ActiveMQ can use the WebLogic security realm to process a login and then you can configure the WebLogic principals (users and/or groups) that should be allowed to perform read/write/create/remove actions on a per-broker or per-destination basis. You may choose to use authentication only, in which case any user with a valid WebLogic login can access ActiveMQ, and no custom code is necessary. You may also add authorization to that using some custom code, to apply specific security constraints to specific users or destinations. For purposes of this example, we have only implemented an authorization approach that allows any member of a single specific WebLogic group to access all resources in ActiveMQ. Between the authorization plugin provided here and the default one provided with ActiveMQ, you should have the foundation to enhance this if more feature-rich authorization is required. ActiveMQ uses a combination of a local journal (files on the file system) and a backing database by default. In the standard configuration, an embedded Derby database is used. This runs fine in WebLogic, but it’s also possible to have ActiveMQ use a database connection pool defined in WebLogic, rather than using a separate Derby database. The configuration files shown later have commented-out sections referring to a WebLogic database connection pool – if you want to use those, you’ll just need to set the correct JNDI name that was used for the database connection pool. Note that ActiveMQ will create the tables it needs the first time it connects to a database, so no particular preparation is required for the database. 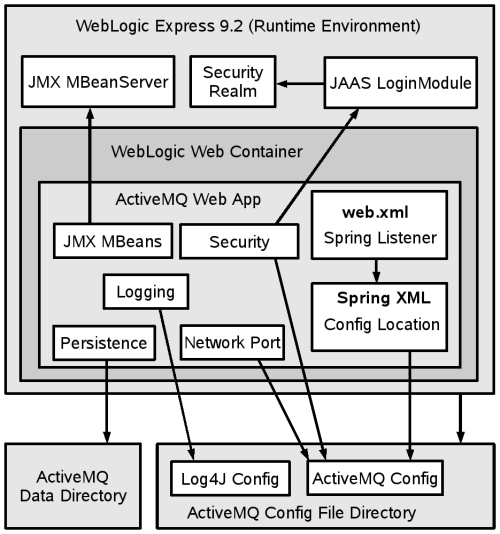 ActiveMQ uses two main resources from WebLogic Express – the JMX management server (MBeanServer) and the WebLogic security realm (in the form of a JAAS LoginModule). In order to start ActiveMQ when the web application is deployed, the web.xml includes a context listener for Spring, and the Spring applicationContext.xml file loads the ActiveMQ broker and points it to the ActiveMQ configuration file (which as mentioned above, is stored in a directory on the class path). The ActiveMQ configuration file also identifies a network listen port that ActiveMQ will listen on for JMS clients. Any clients must include the server’s hostname and this listen port in their connect URL. This section discusses the code, libraries, and configuration files necessary to build the ActiveMQ web application that will be deployed in WebLogic Express. ActiveMQ needs to start when the web application is deployed or started, and stop when the web application is stopped or undeployed. The easiest way to do this is to a use the commonly available Spring listeners, which start a Spring context, which can point ActiveMQ to an XBean configuration file, which starts ActiveMQ. A little roundabout, but it works well in practice with very little configuration. Again, the web.xml listener starts Spring and reads the Spring META-INF/applicationContext.xml file (the default location used by the ContextLoaderListener), and the applicationContext.xml indicates that the ActiveMQ configuration file should be read from the class path with the name activemq-config.xml. That file could be placed in WEB-INF/classes or in a directory on the file system that is added to the WebLogic class path (for ease of editing). With this approach, the normal WebLogic deployment tools, admin console, etc. can be used to deploy, start, stop, and restart ActiveMQ (packaged into a web application WAR). ActiveMQ required a number of JARs which should be included in the web application WEB-INF/lib directory. Additionally, to build the custom security plugins, the WebLogic server/lib/weblogic.jar is presently required at compile time. Of these, Derby could be omitted if ActiveMQ was configured to not use a database for persistence or to use a separate database (e.g. a WebLogic database pool) for persistence. The WebLogic JAR is needed only at build time (it’s provided by the server at runtime). Spring could be omitted if a different strategy was used to start and stop ActiveMQ when the web app was started or stopped (a little custom code could replace this dependency). The rest are probably unavoidable, unless ActiveMQ changes its dependencies in a future version. There are two custom classes used for this example. We’ll show in a minute how to configure ActiveMQ to use these. Note that these are optional – if you don’t want to leverage WebLogic’s security realm, you can skip these. The first class makes ActiveMQ use the WebLogic security realm for authentication, and lets you specify a single WebLogic group to use for authorization (only members of that group can access ActiveMQ, though group members have full access to ActiveMQ). This class is an ActiveMQ “plugin”, which installs two filters (authorization and authentication) which will be invoked on every request. This is similar to the default behavior provided by ActiveMQ’s JaasAuthenticationPlugin and AuthorizationPlugin. * handle the login and provide user and group principals. * property in the main ActiveMQ configuration file. The second class is the authentication filter used by the class above to authenticate all logins against the WebLogic default security realm. * A broker filter that authenticates callers against WebLogic security. * all the logged into users. This section shows three sample ActiveMQ configuration files – one for a single broker with the security and management plugins listed above, and one for a network of two brokers with the security and management plugins listed above. If you want to skip the security and management plugins, you can remove those attributes from the main <broker> element and remove the <bean> definitions for them below. It also shows a Log4J configuration file, which controls the ActiveMQ log output. # Can change this to "INFO, out" or "INFO, out, stdout"
The ActiveMQ configuration file and Log4J configuration file will be stored in a subdirectory of the WebLogic domain directory for ease of editing. They may be packaged into WEB-INF/classes in the WAR for ease of distribution instead. The ActiveMQ JMX management features will be exposed via the WebLogic runtime JMX MBeanServer. This is not required, but it should allow existing WebLogic management scripts to see the ActiveMQ MBeans. NOTE: Additional configuration is required if the Sun JVM JMX server or JRockit management server will be used instead, or if the embedded ActiveMQ JMX server will be used instead and more than one ActiveMQ instance will be run on the same server. ActiveMQ will be installed on a single WebLogic instance or on two WebLogic instances in a Network-of-Brokers configuration. In a (Network-of-Brokers) cluster, the two ActiveMQ instances will use specific URLs to locate each other, rather than attempting runtime discovery of arbitrary brokers that may be present on the network. Either ActiveMQ security is disabled, or ActiveMQ logins are validated against the WebLogic default security realm and a login is required and any member of a designated WebLogic group can access ActiveMQ. If the JRockit VM will be used on Linux, the file handle limit of the user running WebLogic may be important (test with ulimit -n). A recommended value would be at least twice the expected maximum number of JMS clients. In activemq-config.xml, review the port for the current ActiveMQ server defined in the <transportConnector .../> line, if ActiveMQ clustering will be used, review the hostname and port for the other ActiveMQ server(s) in the cluster defined in the <networkConnector .../> line. Deploy the activemq-4.0.1-web.war file, by copying it to the domain-dir/autodeploy directory or using the deployment tools in the WebLogic console. INFO  JournalPersistenceAdapter      - Journal Recovered: 0 message(s) in transactions recovered. Test a security if desired by running the example producer and consumer from an ActiveMQ 4.0.1 distribution. Note that the connect URL is in examples/build.xml while the connect username and password need to be added to examples/src/ConsumerTool.java and examples/src/ProducerTool.java to connect successfully to a secure instance.